Opposition political party Forum for Democratic Change (FDC) is demanding for an independent audit into the February 18 presidential elections in which the incumbent President Museveni was announced winner. 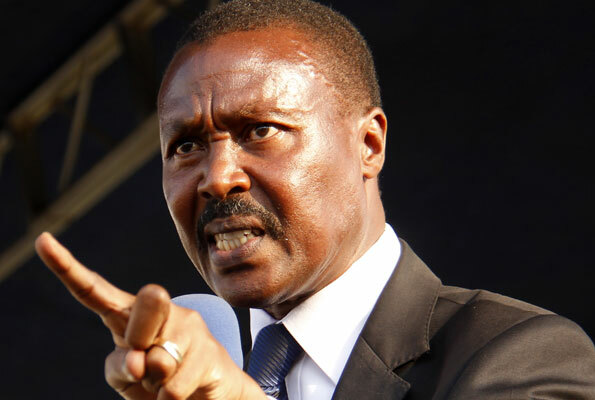 Gen Mugisha Muntu, the FDC president, says given the gross irregularities and ‘rigging’ that marred the elections, it is prudent that the poll results are audited by a committee of independent individuals and eminent persons from the international community. Citing about 50 polling stations where President Museveni is said to have garnered 100% of all the votes cast, Muntu says this is just a drop in the ocean of the pointers to the fact that the election was ‘rigged’ and requires an in-depth investigation. ..we pursue the path of an independent audit.. it will unearth a lot, lead us to know the truth”, Muntu said. Muntu told journalists at a media briefing at the FDC party headquarters in Najjanakumbi this afternoon that the continued blockade of FDC presidential candidate, Kizza Besigye from accessing courts of law is telling of a state aimed at violating citizens’ civic rights. The FDC National Executive Council (NEC)’s decision to call for an independent audit comes a day after the closure of the 10 days window for the party to challenge the poll results in court. FDC failed to petition the Supreme court to challenge the poll results, citing interference by security on their presidential candidate Besigye. The party is considering whether or not to support the election petition by independent presidential candidate, John Patrick Amama Mbabazi. On Tuesday, Mbabazi’s lawyer petitioned the Supreme court demanding the annulment of the presidential election results and declaration of Museveni as president elect. However, Ofwono Opondo, NRM the deputy spokesperson scoffed at this, noting that FDC does not have credible evidence to prove its claims on vote rigging. “I challenge them to produce the evidence because all they have done is talk about it but with nothing to show. That claim of 50 polling stations all voting for Museveni is possible. Let them prove otherwise,” Ofwono said. Another resolution by NEC is that security agencies withdraw immediately from the home of Besigye in Kasangati and the party headquarters in Najjanankumbi. When asked about efforts by presidential candidate, Benon Biraro to mediate talks between Besigye and Museveni, a tough talking Muntu said Museveni is unreliable and cannot be trusted and for any talks to take place there must a written set agenda involving all the country’s stakeholders. Muntu further said that no matter how long it takes, they (FDC) can only adjust time but not the objectives of cracking what he called the arrogance and impunity of the regime. Muntu alluded that under pressure, President Museveni can also wilt and give in. He cited the example of the presidential debate which Museveni initially snubbed calling it a school debate but went ahead and attended the second round of the debate after realising that the opposition had gained capital out of the first round. Muntu said in pursuit for rule of law, they will engage go for a full scale engagement with the population. He said the police and other security forces can “choose to continue stay at Besigye’s residence and at FDC headquarters for days, weeks or even a month” but FDC is determined to protect the “choice of the people who voted for change”. Muntu said nobody wants to live in a country where ‘impunity’ is the order of the order of the day where security forces can ‘illegally’ choose to besiege Besigye’s residence and FD C headquarters, arrest party officials and journalists whenever they feel like it even without any legal basis. He said in the last 11 days Besigye has been arrested nine times and that following those endless arrests he was not in the right mind to even engage with his lawyers to work on the election petition. Muntu said over 300 FDC supporters have been arrested from diffrent parts of the country in the election period alone. He demanded that they immediately be released.